Websites - an integral part of any business are a must have nowadays! Anyone who is tech savvy, checks out websites in order to buy products and services. It is quite a commonplace activity. But what is not that common is the knowledge of what technique is used to make a website. Unless you are in the IT filed, majorities are laymen and are not aware of the technical terms. Nowadays for a highly functional website, PHP MYSQL is the preferred tool to create and style a website. One of the major open-source benefits of PHP & MySQL web development is that it is an extremely simple tool that is easy to use. In fact the PHP developer community can be extended as per the requirements and specifications of the client. 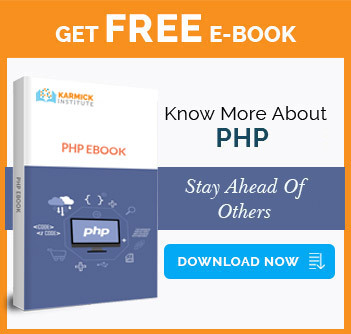 At Karmick Institute’s PHP Training Center we teach you how to use PHP / MySQL to build websites that are easy to run and hassle free to operate. Another interesting reason why this tool is gaining popularity is because it boasts of open source programs like WordPress, Joomla, Drupal in addition to the ecommerce development alternatives like OsCommerce, Magento, WooCommerce, Prestashop. Even the MVC frameworks Zend Framework, Laravel Framework, Yii Framework, CakePHP Framework, Codeigniter Framework that makes it possible to create robust ecommerce sites that sells products and services online. Dynamic: it is possible to create dynamic website, all thanks to the side scripting language of PHP. Ease of use: PHP is not only easy to use; it is a highly stable medium ensuring longevity of the website. HTML embedded codes: there is no need to go for any separate coding when you are opting for this open source tool. PHP comes loaded with HTML features. Cost effective: PHP is extremely cost-effective. There is no need to spend extra as it comes with a free license. The Apache/PHP/MYSQL combo runs perfectly well on low cost, low end hardware. Ideal for ecommerce development: PHP can easily be customized as per the requirements and specifications of the client, thereby making it the ultimate choice for sites that sells products and services online. One of the major attractions of this basic PHP course is the module on Codeigniter Framework. We offer this module both as part of our Basic and Advanced Course. Students can also learn the basics of Wordpress under this course. It includes overview, installation plus configuration with Backend over view and Theme Development and theme customization. We understand how the latest market trends require one to be technologically savvy. To make your career prospects lucrative and demanding, we offer this facility. Ecommerce platform solution for all your online business needs! Customizable websites possible - just the way you want them! What is the eligibility criteria for the PHP course? You can be a graduate / B.E/ B.Tech/ BCA/ MCA. No. It is not necessary to have a technical background. You can be from Humanities or other other stream and still can learn PHP. Why should I choose Karmick Institute for this course? We teach from scratch and our modules cover all the latest aspects of PHP under this course so that a student doesn’t feel out of place in his/her career. Our fees is much less compared to other institutes. Classes are also held on weekends for the convenience of working professionals and students. Learning anything that is trending and popular always helps. Currently, PHP/My SQL is the most preferred framework for building a website. Moreover, this framework encompasses several other popular platforms like Wordpress, Joomla, Zend, Drupal, Magento, Laravel, Prestashop etc.which are used to develop robust websites in a hassle-free manner. So, by learning this course, you will be exposed to multiple job options and can become as popular as the framework itself. Yes. During the course you will be trained to develop websites on your own. After the completion of the course you will be given the opportunity to build a website independently. Which are the industries I can build a career in as a PHP developer? IT industry has vast opportunities for PHP developers. Nowadays, there is demand for PHP developers almost in every industry seeking online presence.